For quality and process control many elemental analysis techniques are available. Let’s see how ICP, AAS, ICP-MS, ICP-OES and X-ray fluorescence spectroscopy (XRF) stack up are traditional techniques used in many industries. Each of these techniques has a number of advantages and disadvantages giving the analyst the flexibility to choose which technology suits best. When the required limits of quantification are above 1 ppm (µg/g), or when the non-destructive analysis is required, XRF is a very attractive technique that should be considered, especially when analyzing solids, powders, slurries, filters, and oils. 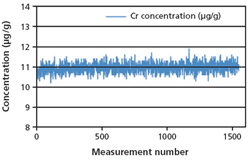 As opposed to ICP and AAS, XRF spectroscopy does not require sample dissolution or digestion, therefore allowing for essentially non-destructive analysis. By avoiding the potential for inaccuracies caused by incomplete dissolution and large dilutions, the complete analysis by XRF helps to ensure the accuracy and reliability of results. Measurements by XRF are carried out directly on the solid material (or liquid) with little to no sample preparation. XRF analyzes any type of sample without the need for dilution or digestion and therefore no disposal of chemical waste is necessary. Transferring liquids in wet-chemical methods from one vessel to another can introduce contamination and/or loss of material. In benchtop XRF spectrometers the sample is excited using an X-ray tube and the characteristic X-rays from the sample are detected and automatically processed by the software. These low-power X-ray tubes don’t produce an extensive amount of X-ray photons or heat and therefore don’t damage the sample or alter its crystal structure. Irregularly shaped samples that fit into the spectrometer can be analyzed without the need for destructive sample preparation, like cutting, crushing and grinding. The same sample that was analyzed by XRF can later be analyzed using other techniques for further investigation, if necessary. Taking into account the initial costs of instrument and infrastructure, and running costs of gasses, acids, electricity and waste disposal, XRF benchtop spectrometers are far more cost-effective than ICP and AAS. 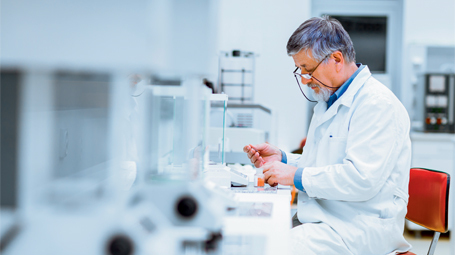 XRF does not require the use of expensive acids, gasses and fume hoods. The only requirement is electricity and in some cases the use of helium to boost the sensitivity for light elements in the sample. Also, the individual components in XRF spectrometers are not exposed to friction or heat and therefore last for many years. 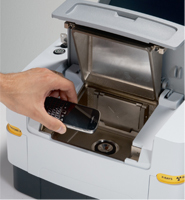 The latest advances in excitation and detection technology make the current generation of XRF benchtop spectrometers very stable. In comparison with ICP and AAS, XRF doesn’t need gasses or liquids to operate. Therefore, changes in the calibrations due to the purity and stability of gasses are not an issue for XRF, making daily re-calibration of the XRF instrument unnecessary. If you’d like to find out if XRF is a good fit for your elemental analysis needs, please contact us.